With the weather outside so cold, I decided it's time to bring spring on!!! This Kioshi paper from Basic Grey is perfect for spring projects. 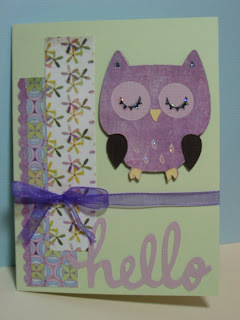 This card features two Cricut cartridges - Beyond Birthdays and Create a Critter! The owl cut is one of my all time favorite Cricut cuts!